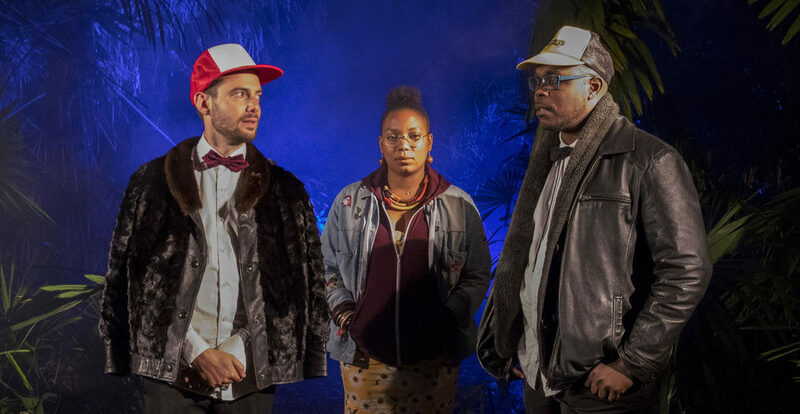 French trio Dowdelin united to create a sound driven by multiple inspirations and desires; French Caribbean music, Afro-American influences, Jazz and Afro-futurism, leading them to naturally introduce a ‘ ‘Future Kréol’ sound. Dowdelin’s debut album ‘Carnaval Odyssey’ got its UK release in early 2019, with tunes like ‘Laissé Mwen’ and the mellow ‘Slow Down’ catching our imaginations. With a hugely original album, we’re excited to welcome them to London on 13 April, playing on the Supreme Standards stage of Love Supreme at the Roundhouse. Get tickets here. Before the big day, we get to know Dowdelin a little bit better, chatting with producer and band member, David Kiledjian. \\ Tell us the story of how Dowdelin got together. We met through Olivya asking me to make music together. I was not too much into producing a French girl singing in English, so when I knew that she was Creole speaker, I proposed to try something with French Caribbean music. I already had a little knowledge of this music by playing in a Carribean jazz collective back in the days with Raphael. It felt very natural to ask him to join in Dowdelin after I had produced the first songs. \\ Tell us about writing the album – what was the creative process like? For the first songs, Olivya was sitting next to me in the studio while I was trying to express a very personal and subjective vision of French-Caribbean music, coloured by our own backgrounds. Then Raphael came in with more knowledge about Gwoka music (Guadeloupe), adding Gwoka drums all over the place. \\ Tell us about the music scene around you in Lyon. Who are some of the other bands we should be looking out for from the area? I work just next studio to Peter from Vaudou Game and played on couple of his albums, his last one is so killing! I also like Ukandanz, a powerful Ethiopian Prog Rock band. Pixvae is very good too, playing contemporary Colombian music through distorsion. \\ You’ll be performing at Roundhouse next month; what should we expect? Any new tunes? We’re so happy and looking forward bringing our music in England, you guys have a very inspiring scene out there. Obviously we’re gonna play some songs from our first album, then some more party ready ones! Joining Dowdelin are Kamaal Williams, Laura Mvula, Melt Yourself Down and more. Get tickets.